Studies conducted by the Corporate Leadership Council indicate that it’s important for new employees to quickly acclimate to their new work environment. It’s important for new employees to start building rapport with colleagues so they can begin to assimilate into existing workgroups. By doing so, new employees experience a sense of purpose within their new organization and the transition into this organization is less disruptive. Making employees feel welcome is an important part of the onboarding process. More than 90 percent of organizations surveyed have onboarding programs for full-time employees, and 81 percent have them in place for senior-level executives, only 66 percent provide on-boarding to internal job transfers. Eighty-six percent of all companies believe it takes up to six months for a new employee to make a firm commitment to stay with that company longer term. Best-in-class companies are more likely to formally include socialization into the standard on-boarding process (94 percent) and to assign a mentor or a coach to new employees (59 percent). Best-in-class companies are also more likely to actually obtain feedback to verify a positive onboarding experience. Ninety-three percent of all organizations offer two types of on-boarding programs: cultural socialization and mentoring. A recent research study of nearly 800 organizations identified key performance indicators that separated best-in-class organizations from the industry average and laggard organizations. Seventy percent of all organizations studied are currently pursuing onboarding to impact new employee retention. Voluntary turnover rates of new hires in the first six months. Diversity voluntary turnover rates in the first six months. Percent of involuntary terminations of new hires in the first six months. The percentage of hires, when surveyed after six months on the job, who rank onboarding as a “major or critical contributor” to their performance. The percentage of hires who left the firm within six months, who cited onboarding (in a post-exit survey), as a contributor to their leaving/failure. New-hire satisfaction rates (including separate metrics on high priority hires and diversity hires) with both corporate and “local” onboarding processes after one month and six months. Note: this metric can reflect onboarding’s impact on your employment brand. Research shows that an employee’s first 90 days with an organization are a critical time. During these first 90 days, new hires may determine whether the organization is the ‘right fit’ for them. In our experience, organizations should focus on providing new hires with engaging job-specific training and tools, support and guidance with development planning, coaching and feedback. Many organizations take a short-term view of new hire onboarding, with limited, if any, new hire support beyond the initial orientation period. 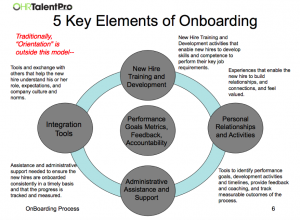 Why is Onboarding Critical in Today’s Workplace? In today’s global workplace market, potential employees are seeking cultures that meet their needs. Implementing effective attraction, selection and retention, and onboarding processes can have a huge impact on the organization’s value proposition as an employer. If candidates have a negative experience, they will complain, terminate, or not accept the job, and tell others about their experience. Most new hires complain that after receiving their acceptance letter, the lackluster welcome and frustrating onboarding system – filling out papers, testing, communication, orientation, emails, cell phones, computers, and interaction with their new boss, peers and coworkers negatively impacted their experience. Programs that take a system-wide approach to address these five key elements throughout a new hire’s first year are the most effective in increasing new hire time-to-productivity, engagement, and retention. A managed, consistent experience – assistance and administrative support is needed to ensure the new hires are on-boarded consistently throughout the organization in a timely basis and that the progress is tracked and measured. Tools and exchange with others that help the new hire understand his or her role, expectations, and company culture and norms. Tools to identify performance goals, development activities and timelines, provide feedback and coaching, and track measurable outcomes of the process. Training and development activities that enable new hires to develop skills and competence to perform their key job requirements. Experiences that enable the new hire to build relationships, and connections, and feel valued. If you are interested in learning more about Recruiting, Selection, Onboarding, and Engagement, check out our Talent Management Certification Program (TMCP). The Institute of Organization Development, www.instituteod.com, offers an online Talent Management Certification Program (TMCP) for those interested in advancing their careers in the field of Talent Management. Participants learn how to help their organizations implement an aligned talent management strategy and receive the guidelines, tools and resources needed to be successful. “I work in Talent Management but have never had the training and exposure to Talent Management best practice strategies and processes until this program.